I absolutely love traditions. And I absolutely love documenting my children and their growth. This next project marries to two together. Every January I take a new handprint of my children and display in on the wall. One row for my son, one row for my daughter (added in 2011). I purposely don't stamp their hands onto the canvas because there is no room for error. 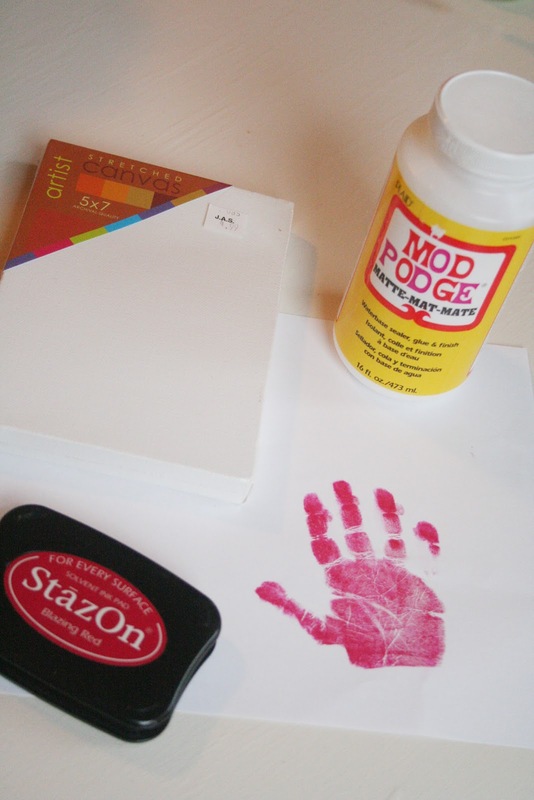 I instead, stamp their hand on a white sheet of paper until I like how it looks, then cut around it and mod podge it to the canvas. Such a simple project with lots of fun decor possibilities. And what kid doesn't like stamping their hand?? PS - don't forget to check out my NEW website! And remember, for a short time, get double the Reward Points by mentioning that you read my blog in the checkout process! Such a wonderful idea. Wish I had started when my girls were younger. Now their hands are almost as big as mine!